How does it work?  Partido X. Candidates for elections are common citizens, they do not necessarily belong to the Citizens’ Network X Party. Our only concern must be that they be competent, qualified, honest and capable people. 1 – Candidates may be nominated by anyone: people subscribing to X Agenda, (our news agenda is open to anyone interested), regardless of them belonging or not to the Citizens’ Network X Party. A. Candidates nominated by anyone through the Internet. Any person inscribed in the X Agenda (Citizens’ Network X Party news agenda, open freely to subscription) may propose one or more candidates. The proposal must be accompanied by a video that reflects the candidate’s thinking (it does not have to be a dedicated video). This list is created on-line and, during a fixed time frame, any person registered in the X Agenda can support all of the proposed candidates they deem competent according to the criteria listed above. People put forward by a sufficient number of participants (circa 25%, it will be specified on each occasion) make up List 0A of the sequence. B. Candidates nominated by the Citizens’ Network X Party regional Nodes or Matrix. The Kernel, Nodes and Matrix can choose independent individuals or individuals from their own Node and put them forward as candidates. Each person points out those they think can carry out this task. The proposal is carried out freely and anonymously so no one can be coerced in their choice. As in the previous case, individuals who have sufficient weighted support (circa 25%, it will be specified on each occasion) make up List 0B. 2 – The Kernel and Matriz will be in charge of contacting those people put forward as candidates, which make up the “0” lists, in order to confirm their conformity and respect towards the proposed criteria: they cannot have felony or corruption convictions; cannot be active members of political parties represented in parliament; must support the programme and be ready to defend it; must align with the working method of the Network. The results and justification of this first filtering of candidates will be published, with a short space of time for possible amendments.The result is List 1. The verification according to the criteria exposed above will continue throughout the whole process. 3 – Once the first List is finished, with every candidate having a related video showcasing them to the Network, an open streaming event will be organized on the internet: candidates will go through a “”trial-by-fire””, a sparring event in which everyone can send questions to test candidates’ readiness.After that, users of Citizen’s Network X Party hold a free and anonymous voting, taking into account the weighting criteria, to prioritize candidates who have demonstrated being able to live up to their future responsibilities. Candidates that do not wish to go through the “Trial-by-fire” stage can be candidates but only for the end of the electoral roll. This is done to avoid rejecting the competencies of people who are less experienced in public speaking. Watch Out! We must be on guard: open lists end up being for “celebrities”, for popular people, for those who appear in the media. We are interested in fostering competent ordinary citizens who forge their public recognition based on their own work and are prepared to accept the challenge that citizens are facing. Therefore, on the final order emerged from the vote of the community after the “Trial-by-fire” sparring event, people who come from List 0B should not be relegated because they are not in the media; in that sense, our method ensures that they will occupy, at least, the odd numbers of the final electoral roll. In the same way, gender parity legal conditions must be applied. This final list can be submitted to another ratifying “Trial-by-fire” sparring event in order to make sure that these adjustments keep giving a satisfactory result for all users. A Citizens’ lobby that fights for “Just Democracy” and for an Emergency Plan to tackle the crisis in favour of society and not of banks and political elites. If we do not create the mechanisms that make democracy efficient, we won’t have an answer against anti-democratic forms of government. We are going to do it together and we are going to do it well. We are going to create a robust and qualified structure by combining our competencies. Healthy and functional communities have been proven to work properly when the system offers free access to those who find affinity with the project; however, no one is expected to take part in the same way or devote the same amount of work, this is not normally possible due to the nature of human relationships, as is explained in 90-9-1. As in all group projects, different degrees of implication and commitment evolve naturally. In the same way, as in scientific research, the essential condition for a project to be kept alive and keep its contents is to gather a group of participants who may develop it actively [these is the Kernel group and the Developers]. A slightly less intense and deep participation coming from people which can contribute less of their time to the Network than the previous groups is, however, paramount to our working environment [we have called this group the work Matrix]. The Matrix delivers valuable specific knowledge to the Network and allows reaching into broader information pools and resources. Finally, there are some people who just lay observant, provide assistance sporadically or simply would like to be informed. These people accounts for 90% of the participants of the Network. It is them who provide the value of acting as a vigilant audience, ensuring that the project is duly observed, and thus, improving the whole system. This “arrangement” is reproduced in the same way in all spheres of the human interaction; in some cases, we will be part of the 90% of people who just watch and in some other cases, we will be part of that 1% or 9% who keep things evolving. This allows for many projects to be carried out in many different fronts; all evolving around the same core who keeps them alive and a group of people who amplify and strengthen it. It consists on balancing the degree of participation mentioned in the section above within an actual democratic structure (that is, of free access but still functional). We must keep in mind that, as far as we have seen, we are all different, meaning that we are not the same in terms of participation, competence and commitment. The democratic efficiency has been proven to be lower in large groups, in which the high number of participates leads the decision-making process to be reduced to “yes or no”, favouring easily the “no” position”, impeding further progress. For this reason, in each decision-making core, the group of participants who naturally comes up to be the most active, competent and omitted within such field must be valued in order to take urgent, complex and innovative decisions. If this is not the case, decision-making becomes unbalanced towards the larger group of people who have had less compromise, have participated less and have less information; this discriminates against the better judgement of people with a higher degree of knowledge in the specific topic which is being worked on. 1- Implication: any person who devotes more of his/her time to the project has a higher awareness of which is the current situation and which problems must be resolved. 2- Proven Competencies: is a person has an expert level knowledge on a specific topic, his opinions towards that topic should probably be taken into account. 3- Peer Recognition (by other people who you work with towards your own work): Competencies and the thoroughness of our work cannot be demonstrated only by proclaiming or asserting them; they are, however, demonstrated through one’s daily work. It is through this type of recognition that the rest of the people involved identify the value and quality of each person’s work. 4- Rigour in the common goals: knowledge, work and each person’s own judgement will make sense within the project in the measure that they are related to the objectives that have been proposed by the Citizen’s Network X Party. Each person’s strong competencies must be at the disposal of the common goals of the project. 6- Seniority: those people who have contributed to the project for a longer time generally have a broader view of how it has evolved; of course, only if they have remained active throughout the life of the project. As we never start from scratch, it is paramount that we respect the knowledge that has been accumulated. Up until now we have strived to emphasize that what really matters is the work done and not “names”. This is the best cure against personal bias and egoism. Now that this is clear to everyone, we will take a step forward and present a consolidated Citizen’s Network. This Citizen’s Network is a living, breathing, project; the names of the people involved change constantly based on those who, at any given moment, devote more time and work (aided by dozens of others). Because of this, we could never show each and everyone of the individuals that participate currently, that participated in the past or will take part in the future. The roles change based on availability, competencies and dedication. We want to make clear the difference between what the legal and administrative structure of the X Party is and the Citizens’ Network X Party. Decisions are made by the Citizens’ Network X Party meanwhile, the X Party (Partido X), a legal structure deposited in the Spanish Ministry of Internal affairs, plays an administrative role. It is for this reason that it uses strictly the minimum required to function properly. The legal and administrative structure of the X Party serves only with the purpose of legitimizing the Citizen’s Open List and allowing for the candidacy towards the elections, carrying out the pertinent legal paperwork. The “steering committee” doesn’t concern themselves with the politics, that is, its members will not form part of the elections. Their function is to allow for the legal and administrative functioning of the X Party. Furthermore, the president of the committee will not be able to stand as a representative. At any given time, these administrative functions are carried out by 3 to 5 people belonging to the Developers group. These individuals work on a rotation basis: the are temporarily affiliated and cannot join the run for elections while they remain affiliated. Each of the initiatives and decisions made from within any part of the Network are made public to the rest of the members. X AGENDA: (Citizens’ Network X Party news agenda, open freely to subscription) is a mailing list containing information for anyone interested in the project. The X Agenda is also the platform to which offers of collaboration and petitions for help are sent. It is also the first step you must take if you would like to actively take part in the election of candidates and other activities. 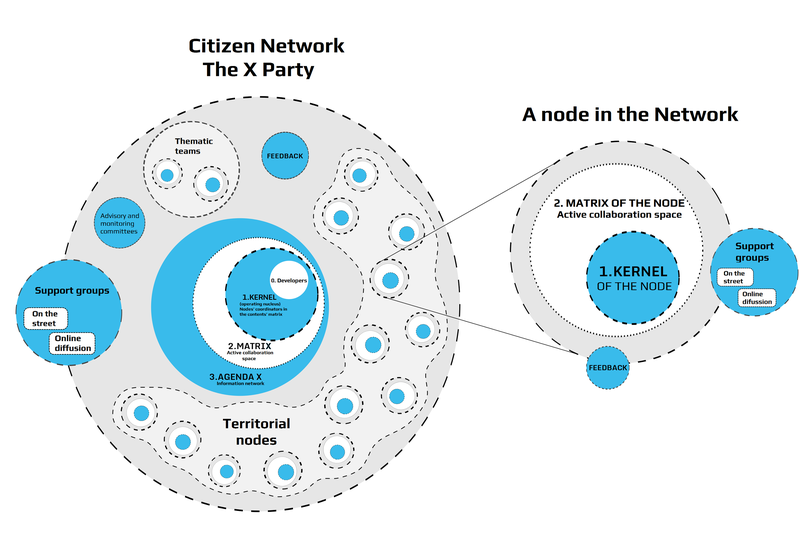 USER OF THE CITIZEN’S NETWORK X PARTY: The people who pro-actively and positively respond to the offers of collaboration and petitions of help which are sent to the X Agenda mailing list, the social network pages and the territorial nodes will be able to create a User login for the collaborative tools of the Network. This will allow for the periodic responsibility of voting and prioritizing the different candidates and contents of the government efforts. If a reciprocal affinity for the working method is established between the parts, and if they so wish, these people might join the Matrix work group, which requires a higher dedication and work. The phase dedicated to the creation of Users for the Network will come on-line at the end of 2013, starting with those people who already form part of the X Agenda mailing list. EXTERNAL SUPPORT TEAMS: Those individuals who do not have much time available at their disposal and are not willing to commit to the strict working method of the Network, or those in which we have not found a mutual affinity in the way of carrying out work but which still wish to support the project. MATRIX – Active and collaborative implementation environment: This is a working and educational environment for those people which are committed to the project and show affinity towards the working method; they must be willing to accept tasks and should agree on the internal functioning of the Network. The Matrix amends the work carried out by the Kernel group and vice-versa. No person that has not participated in the territorial Nodes or the Matrix work group can belong to the Kernel group. The Matrix environment is where people can learn about how we work, the contents of the project and where the proposals are first trialled. KERNEL – Operating Core: It coordinates the territorial Nodes, the work Matrix and the Developers group. A member of the Kernel is simply a contributor (a certain X Citizen) actively implicated in the Matrix group or in a Node, who eventually assumes a great volume of work and a high degree of responsibility in the area represented by his/her competencies. For this reason, Kernel is the environment in which the general decisions, the ones that affect the project as a whole, are synchronized, coordinated and unified. This includes the way we organize ourselves, our strategy, narratives, content and communication efforts. The Kernel is a sum of people with set responsibilities, who have honoured the working method and demonstrated acting in harmony with the project’s contents. They assume an extremely high volume of work, which requires many hours every day, and take responsibility for some areas of work or the interconnection between these areas and the project as a whole. People belonging to the Kernel group are expected to participate in the Matrix group and in the X Agenda. The incorporation to the Kernel of people belonging to the Matrix groups or the Nodes is wanted and encouraged due to the intensity and depth of the work carried there, which requires a constant renewal of people. The Kernel group is expanded through the incorporation of people (either from the Matrix or the Nodes) which are capable of maintaining the high work-pace of this group; it is done naturally on the basis of each person’s commitment, the breadth and quality of their work, the qualities identified through peer recognition and only after following a period of at least 3 months in which there is a mutual understanding that the collaboration is truly possible. Those joining the Kernel are accepted by the standing members of the group in order to maintain a functional, like minded, work group. In case a consensus on new members is not reached, a voting will take place. A minimum of 50% quorum is required, with 2/3 of the group representing an unanimous decision. It is common for people who share a profound comprehension of the working method to join the Kernel group, replacing those who cannot assume the amount of work produced in Kernel and are transferred back to the Matrix work group. DEVELOPERS – long duration: People who combine both the capability of assuming a high workload and a longer time forming part of the project. They are the ones settling the bases for this prototype and/or the ones that are in charge of their constant definition as such: a prototype for a completely new type of Citizen’s Lobby which will become fundamental for any Democracy in the 21st century. Their function is to preserve the idea, the research done and the objectives and goals of the prototype, together with the accumulated work, ensuring the continuity of the project. In extraordinary moments when a certain conflict threatens to block the evolution of the project, and in order to preserve its “DNA”, they have the responsibility of making a final decision based on consensus. In exchange, if they are chosen in the elections and while they remain a chosen representative in Parliament, they may not form a part of the Developers group. It is also expected that Developers participate both in the Kernel and the Matrix groups. The Developers group is expanded through the incorporation of people belonging to the Kernel group and on the basis of their recognition by their peers of their commitment, and the breadth and quality of their work. Those joining the Developers must be accepted by the standing members of the group. In case a consensus on new members is not reached, a voting will take place. A minimum of 50% quorum is required, with 2/3 of the group representing an unanimous decision. INDEPENDENT EXPERT CITIZEN’S COMMITTEES: “Well-known” people, independent of the project who, nonetheless, support it and remain vigilant so that it does not stray from the objectives in those topics on which they are strongly competent. Their function is one of being a guarantor from the citizenship and they work as our main consultants. These people have been put forward from within the Citizen’s Network or by any other citizen external to it but subscribed to the X Agenda mailing list, the website, or our pages on twitter and facebook. TERRITORIAL NODES: They spread the Citizen’s Network on a territorial level. 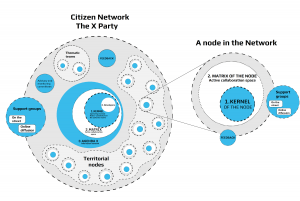 It is the responsibility of the Territorial Nodes to self-organize in order to implement the tactics needed for the Citizen’s Network X Party to “make an entrance” in their local territories. Of course, they must respect the decisions on strategy, narrative, contents and communication efforts made by the Network. Nodes are established with the support and initiative from the Kernel group and not spontaneously. This is kept this way in order to ensure that we all share a common focus and so that internal quarrels cannot rise because of a Node not being conscious of the general goals of the project. For this reason, it is paramount that every person participant in a Node assists to a face-to-face meeting with people from the Kernel group in which a reciprocal affinity is established; furthermore, people akin to the project must participate in a workshop in order to train them in the method and tools used to build up the Node. The internal structure of the territorial Nodes replicates the same structure independent of location: there is an operating Kernel and a Matrix work group, and they respect the same work methodology. The goal is to build a network of empowered nodes, that work autonomously but in connection with the rest of the Network. 1. Node Kernel: It consists of one or more people with specific tasks, put forward by the Kernel and/or by the Node and then confirmed by the Kernel. This guarantees the continuity of the node, the possibility of replacement (if needed), the decision-making and guaranties the functionality of the project. The Node’s coordinator will be part of the Kernel if a good working relationship is established during the 3 months (minimum) adaptation period. As they take on the specific workload of the node, they are not necessarily forced to actively take part in the Kernel, but they must act as observers and provide a connection with their own nodes. They must coordinate the activities of both parts and transmit the information between them. People from the Node’s Kernel assume the responsibility of informing to the Matrix about each of the work-tasks which are finished. 2. Node Matrix: People in their geographical areas collaborating actively towards the functioning of the Node. This is a space where people get involved for specific purposes, and not necessarily in a permanent basis. You may take part in the overall work Matrix and/or in the one in your specific location; however, an attitude towards work based only on “snooping” (passive observant) is not welcome.